A Legislative Lunch and Learn, sponsored by Hunger-Free Pennsylvania and partners was held February 4, 2019, in the East Wing of the Capitol. LAMPa Director Tracey DePasquale served on the planning team. Tracey and Lynn assisted with the event that gathered more than 100 PA Senators, Representatives, staffers and constituents to interact with partners in the Hunger-Free PA coalition to learn about hunger in Pennsylvania. Legislators and constituents visited a series of stations learning about who is hungry in Pennsylvania; becoming familiar with programs that help hungry Pennsylvanians; and strategies to help fight hunger in their districts. Everyone in attendance was invited to enjoy a certified school lunch. 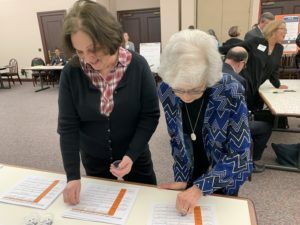 In the accompanying photo, Shirley Pierson (left) and Judy Hunter, members of Trinity, Camp Hill, participate in a budgeting exercise that illustrates the choices food-insecure Pennsylvania families make to put food on the table. Hunger is an issue that impacts the health and wellness of over a million Pennsylvanians – people of all ages, races, religious beliefs, political affiliations, and more in communities across the Commonwealth. One in eight Pennsylvania adults and one in six children experience food insecurity. Event participants received an Ending Hunger in PA Check List encouraging them to promote legislation eradicating hunger in Pennsylvania.